Are you interested in finding out the new salary structure of the federal fire service? We know you will like to know how much a member of THE federal fire service (FFS) earns continue reading….. If you are dreaming of joining the federal fire service which is a federal government agency that is responsible for the control and prevention of outbreak of fire in the country ; then it’s important you check the salary structure, how much the Federal government pays each fire fighter per year for a service render. The federal fire service came into service in 1901, that was during the colonial period,hence we can say that the Federal fire service was established by the colonial masters. The major aim and objectives of the federal fire service is to help preserve the life and property of Nigerians from fire outbreak. Ever since the the federal fire service was created, Nigerians are now heavily dependent on them. Just like every other government agencies, the men of the federal fire service has responsibility that they face in their every day life. With out adequate funding and good packages every month it will be almost impossible for them to render the services they render when call up on. 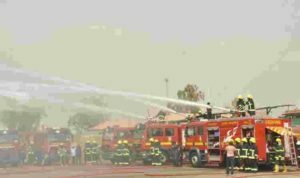 The average salary of Federal Fire Service service workers – N800,000-N1,400,000 annually (we can say that they earn N50-120k monthly). The highest salary is received by the General of Fire Service is about 1.4 million naira. It was stated that salary grade level 07 is automatically moved to salary grade level 08, so this means that Federal officers salaries are growing.